Sterling Silver Cuff Bracelet, "Forest Fronds"
Bali's Komang Wirawan crafts this furling, floral bracelet by hand using luminous sterling silver. The swirling design is a simplified take on the island's ornate woodcarving tradition. You can find sterling silver cuff bracelet 'Forest Fronds' by Komang Wirawan in jewelry categories such as Nat Geo Gifts Bracelets, No Stone Bracelets, Silver Bracelets, Sterling Silver Bracelets and Cuff Bracelets. Enjoy exploring these sections for other Novica treasures. Komang Wirawan has received 4 microcredit loans with 0% interest from Kiva and Novica, the first for $1100 and the most recent for $800. Proceeds were used to purchase silver and gemstones to increase production. The simple, clean lines, with a bit of 'swirl,' make this bracelet an elegant adornment whether I'm wearing jeans and a nice top, or a more refined outfit to dinner. I'm very happy with the quality and craftsmanship. Thanks! I'm in love with this. I wanted a wide band, but don't like to wear a heavy bracelet. It's between fancy (the silver and swirls) and a bit casual (the natural-looking ferns). It could be worn to a party, to work, shopping, for anything except gardening or sports. Komang is an amazing artist. To add elegance and sparkle to your look. Lovely original work and excellent quality ! "Shiny bracelet to be admired"
Beautiful polished silver bracelet. I have received many compliments on this bracelet. 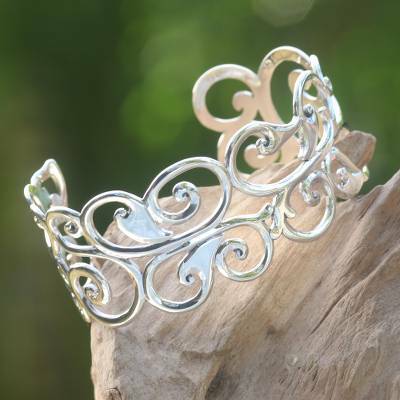 Love the artistic, cut-out design of Nature's Delight cuff bracelet which can be worn with matching band ring. Fits well. "People despised me as a poor boy so I wanted to change my life and make it better because I believed my fate depends on my own efforts. These words became my spirit during my difficult life." "Life is tough, but I'm tougher. Having children has raised my spirit in life. I have developed a more mature thinking and attitude, and a new motivation because I don't want my children to suffer poverty like I did. They deserve to have a better life and live it with happiness. "I was born to a farmer family in 1973 in a small region in Bali famous for its traditional art market. Unfortunately my father passed away and as a son, our customs dictate I must replace my father's responsibilities with my family, as well as in social traditions and ceremonies in the community. As such, my sisters came to live with me, my wife, daughter and son until they got married. "My childhood was not really happy like other people's, my parents sometimes faced crop failures that made life seem like an endless struggle. I had to work hard as a wood carver to pay my school fees right from the first year of elementary school. Growing up in Bali, I saw people carving wood every day as well as craft silver jewelry, so I had no difficulties when I started to work as wood carver. "But all moneys I earned were only enough to pay the school fee, so I went to school with no money in my pocket though I had to walk around 3 km to school. When crops failed we only had very limited amounts of rice to eat. Once I felt so really hungry at school that I fell unconscious. "With my talent and skills as a wood carver, and by observing people making jewelry, I started to work with silver so I could earn a better income than as a wood carver. I needed to earn more since school fees were increasing as well as other needs. "People despised me as a poor boy so I wanted to change my life and make it better because I believed my fate depends on my own efforts. These words became my spirit during my difficult life. One day an old wise man told me that I had to be patient, that my struggles would lead to a better life. "Bali is very rich in culture and arts, and I began to create my own designs with the help of four friends who are also silversmiths. My designs are inspired by Balinese culture, fashion and nature. I work with silver, gemstones and copper or alloys, and I use traditional tools such as scissors, hammer, tongs, and an electric nail drill. "I sold my new designs to shops hoping it would lead to huge orders, but unfortunately, they used my designs as models for mass production with casting machine. "When I graduated from high school, besides being a silversmith I did construction work whenever people needed me, and I also played traditional Bali music in a shop at the airport to attract customers. I really like to play traditional music, it's my hobby, but I hardly have the chance to play since I am too busy with work. "The most difficult moments in my life were when my father laid long in a hospital due to kidney failure and needed dialysis. I wasn't able to work during this time as I was taking care of my father, and yet I needed a lot of money to pay for the hospital, dialysis and medicines. My father finally passed away and I felt so empty and lonely afterward. I realized that I needed a wife in my life, and not spend it only working hard. "In 2008 I finally got married; I was 35 years old. In Bali people are expected to marry as soon as possible as the first big step toward fulfilling your duty in front of God, your ancestors, parents and community. My wife had four miscarriages because she has a cervical weakness. However God was listening to my prayers and finally my wife was able to carry her pregnancy full term, and now we have two children. "In 2002 I joined Novica with the hope of developing my career as a silversmith and so expanding my market. Slowly my products started selling in Novica and I realized that I must focus on constantly creating new designs which hopefully customers will like. Luckily Novica helped me with product development, inspiring me to pursue a better life. "People here know me as a creative, artistic, and idealist person. I am a hard worker, night and day, and people are right: I am an idealist who likes to craft unique products that customers may not always be interested in. For example I crafted many silver statuettes which implied a big investment, and I sold them at local shops but people never recognized me as their author." My mother-in-law is very hard to shop for - especially at Christmas. I ordered the Luminous Faith silver cross and necklace and she loved it. The cross is absolutely beautiful. The workmanship and detail is exquisite - a very stunning piece. I will be certain to follow Mr. Wiraman and would not hesitate to buy any of his pieces. I received my ""Radiant Sunbeams"" amethyst drop earrings today. They're even more beautiful in person. I love them. Thank you Komang. I love the peridot ""Mystical"" dangle earrings. The birds are enchanting and the details are exquisit! Thank you for your beautiful cretions!